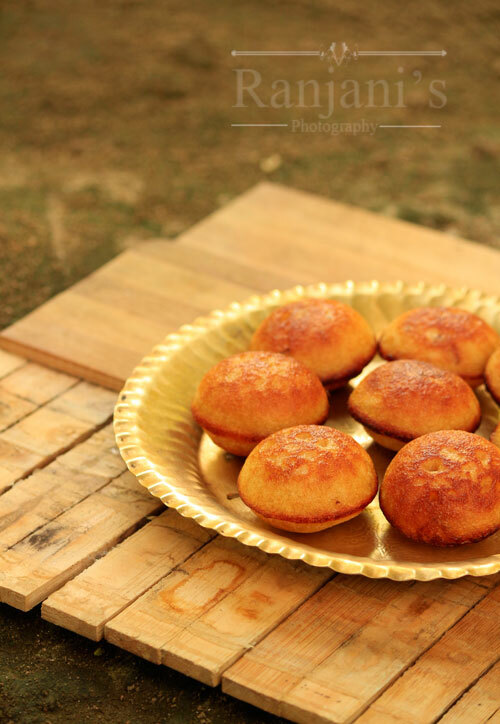 Sweet paniyaram recipe – Can I say its Chettinad sweet paniyaram? Yes, I tried making that way. It came out well.Karaikudi is best known for its traditional values, especially in food. I asked one of my friends in karaikudi about the preparation method of kuzhi paniyaram. She got the recipe from her mom both inippu paniyaram and kara kuzhi paniyaram. Firstly I tried the sweet one. Let me post the savory one as soon as possible. Thanks to my dear friend and her mom for the recipe and exact measures as the recipe came out wonderfully on my first attempt. Sharing you all the recipe here. Soak raw rice, parboiled rice, urad dal and fenugreek seeds in water overnight or for 4 to 5 hours. Rinse well and grind urad dal and fenugreek seeds together. Once the batter reaches coarse level, add raw rice and parboiled rice. Grind it to idli batter consistency. Let it sit for 4 hours to get the batter fermented. Before preparing the paniyaram, prepare jaggery syrup. Heat a sauce pan, Add jaggery and water in it. Allow it to boil till it reaches sing string consistency. Switch off the flame, add cardamom powder. Drain it to remove any impurities. Mix the jaggery syrup and a pinch of salt to the batter and mix well. 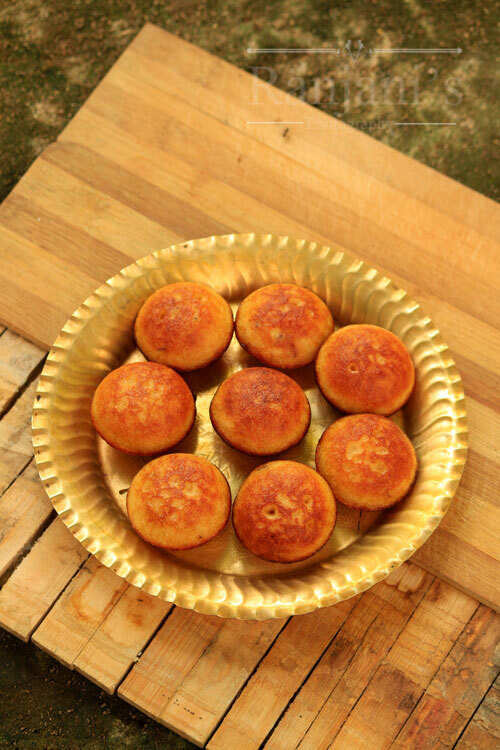 Heat paniyaram pan, pour ½ tsp of oil or ghee in each round. Then pour ¾ th level of paniyaram batter and close with lid. Keep the flame low.After a minute, flip all the paniyaram using fork or spoon to cook on another side. 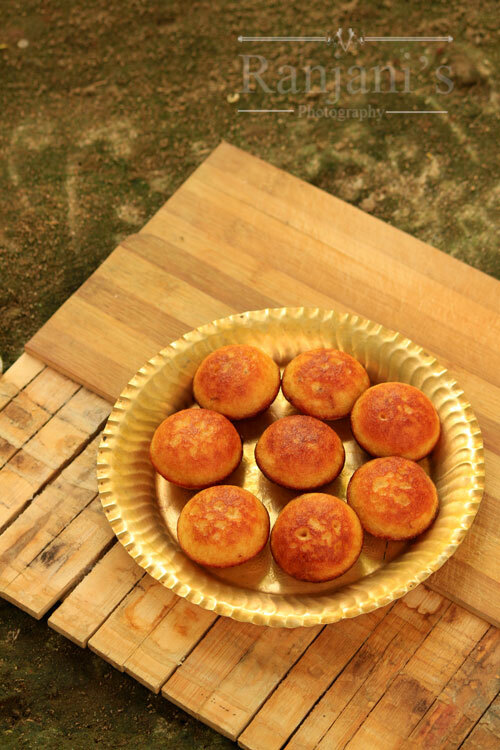 It will get cooked in 2 mins.Take all the paniyaram using a spoon and place it in a bowl. Serve as hot. Use jaggery as of your taste. I always want the paniyaram to be moderate in sweet. So you add more jaggery if you are a sweet tooth. A pinch of salt is enough. The addition of salt in sweet always enhances the taste. So don’t skip it. Keep the flame low as it will avoid burning the paniyaram.